A newly discovered Apple patent application describes a system that would make it easier for Apple Store employees to diagnose water damage in your phone so that they can deny you a replacement. AppleInsider spotted "Mechanisms for Detecting Exposure to Water in an Electronic Device". 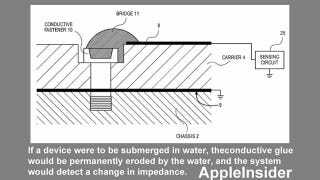 The patent describes a circuit-based system for detecting water damage that would replace the chemical sensors currently used in Apple products. Often, particularly at a point of sale, personnel receiving the returned device may be unqualified or untrained to determine whether or not a device has failed due to manufacturing defects or due to consumer abuse. Thus, personnel at the point of sale may often times exchange the returned product with a working replacement product regardless of the cause of failure in order to avoid potential conflicts with the customer. As a result, it is not uncommon for consumers to receive replacement products or repair services on abused products not covered under the terms of a warranty. Such erroneous replacements or repairs may be costly to the vendor and/or manufacturer of the product.